Focus on getting core right before improving or innovating. This might help and maybe something to think about over the weekend. 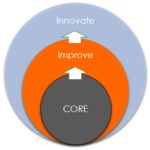 It’s the CORE, IMPROVE, INNOVATE model by Sharon Pearson. In a nutshell…only focus on core business activities and getting them right before you focus on improving your core. 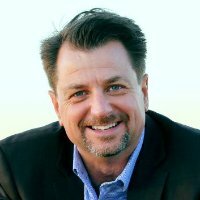 Only spend time and money innovating when core and improvements are done. Core activities is your day to day stuff that makes money, brings business in, processes orders, keeps customers happy, sends out invoices, keeps staff happy etc. My tendency, because I love innovation, was to get distracted with improvements and innovation and I dropped the ball on ‘core’. This is like building a house on wet soggy, soft soil that isn’t compacted or even right for the job! As a result my innovation might work but would fall over because core business was up to scratch. So…if you are switching between ‘this and that’ in your business and not sure what you should focus on…perhaps you are doing what I used to do and are distracted by innovation or improvements? This weekend, have a think about your core activities. What kind of shape are they in?